•Do you know how many available hours there are each day or each week? •Do you know how many labor hours are in the buckets of work that you are filling daily or weekly? •Do you wonder why your company can’t meet delivery dates? All three of those non-rhetorical questions are interrelated and important for the success of a lean transformation. In the last segment I reintroduced the use of an accountability tool known as the Hour-by-Hour Chart for defining output expectations. Expectations are essential so process owners know what their internal customer demand is. The Hour-by-Hour Chart lets them track their own progress toward the demand objective as the day unfolds. It is also a tool for the process owner to keep his leader informed of issues and barriers that are troubling the process and hampering throughput. It is then the leader’s responsibility to break down barriers and assist the process owner in overcoming issues. An important element in determining customer demand for each internal supplier is the production planning process itself. How customer orders are managed in the pipeline and interpolated to develop the expectation for each process owner will be one of the topics of this segment. Of course, the external customer is the ultimate source of demand for every process owner in the enterprise from engineering to delivery. But, how does the demand that comes from multiple customers with varying needs filter down through the system? You can’t control what customers buy, the quantity they buy, or when they need your product or service, but you can control how much enters your process at one time. Everything you make or provide is comprised of a series of tasks that require resources, one of which is time. The time for all of the manufacturing processes rolls into a total that should be used to allocate a portion of the available time in a day to do productive work so meeting customer demand can be assured. I will be referring to the daily amount of available time as a “bucket.” I like that term because it provides a visual of what is happening to the allocation of resources as the hours created by customer demand continually flow into the “bucket” of hours that the shop has available. Just as a bucket overflows when its capacity has been exceeded, so, too, your people’s ability to meet customer demand overflows as demand keeps pouring in. The results include frustrated employees, missed deliveries, disappointed customers, and increased cost due to overtime. So, how do you develop realistic expectations for the internal supply chain while ensuring 100 percent on-time completion of orders? The first step is easy – determine the number of available hours to do productive work. The available time calculation is simply the total shift hours minus allowances for start-up, breaks, lunch, clean-up, and any regular maintenance or meetings. Available time for a typical eight-hour shift is 510 minutes minus five minutes start-up, 20 minutes for morning and afternoon breaks, 30 minutes for lunch, and 10 minutes for end of shift clean-up, or 445 available minutes to dedicate to productive work. It is important to determine available time for each process since some people are involved in regularly scheduled meetings or maintenance activities. The next step is to determine the time necessary to perform various process tasks. Unless you are fortunate to have engineered standards, you may have to apply intuitive knowledge or just plain gut-feel to determine the times. Without process times, there is no way to determine when the bucket is full. Nor is there a way to establish expectations for the process owner. I usually take a few time studies to estimate process times. Time studies don’t have to be sophisticated to determine a start point. More accurate data can be gathered over time. Process times will improve with the removal of waste so don’t spend a lot of time on this step. As mentioned earlier, process times for each of the tasks roll into the total time to produce the varying types, shapes, and sizes of product that make up daily demand. Filling the bucket then becomes a matter of math. Multiply the demand for each product by the total process time for the product and compare the total with the total available time for the day. If available time is 445 minutes and there are 10 production employees, the bucket size is 4,450 minutes. Is that a perfect situation for achieving 100 percent on-time delivery performance? Probably not. But, it provides a better opportunity for success than no gauge at all. 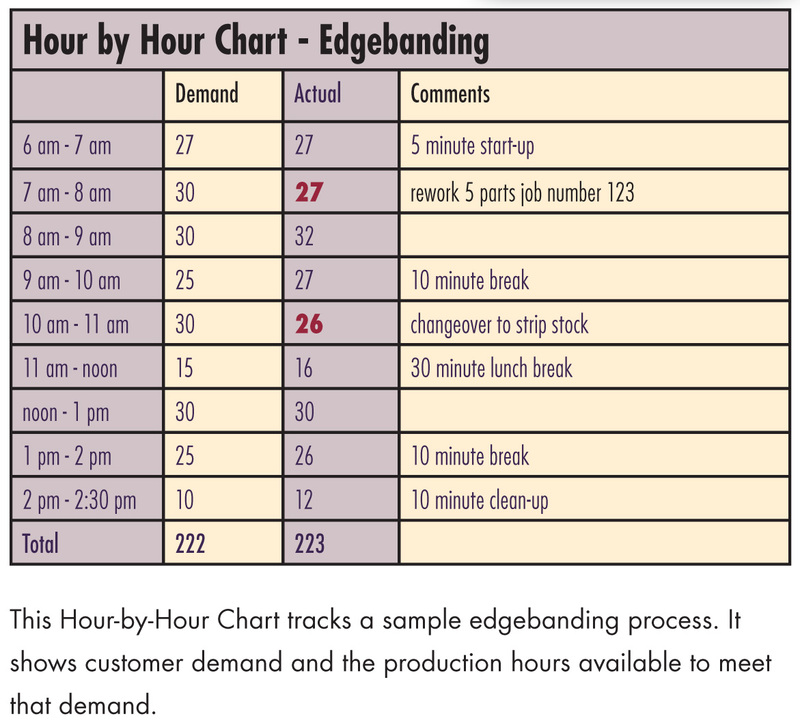 I have included a sample Hour-by-Hour Chart for an edgebanding process. The average time per part has been determined to be 2.0 minutes. Available time is 445 minutes. Not every cabinet part is edgebanded, so the hour-by-hour expectation is based on the number of parts to be edgebanded to meet requirements at assembly. Also, not every part is edgebanded on the same number of edges, so averaging is required to determine the total process time. Note that the hourly expectations are adjusted to reflect available time in that hour block, thus not putting forth expectations that can’t be met. With expectations defined and the chart posted prominently, the process owner and area leader both have a visual reference of the evolving current state. Filling the demand bucket to approximate the total available shop hours not only sets the stage for achieving the on-time delivery goal, it provides a better tool for identifying when new orders can fit into the schedule as well. As buckets fill, new orders move to the next open bucket. In addition, daily buckets can be adjusted for planned absences to more accurately reflect future labor conditions. Communicating expectations and monitoring progress toward those expectations by Hour-by-Hour Charts in conjunction with the daily bucket planning process should be included in every leader’s toolkit. Next time we will look at how work can be sequenced so parts arrive at the right place, at the right time, and in the right order. 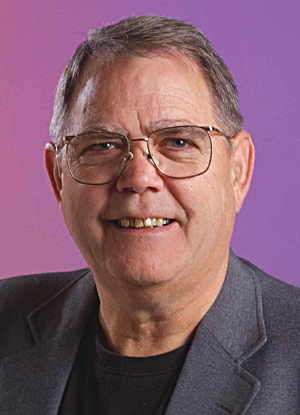 Is your company ready for lean?